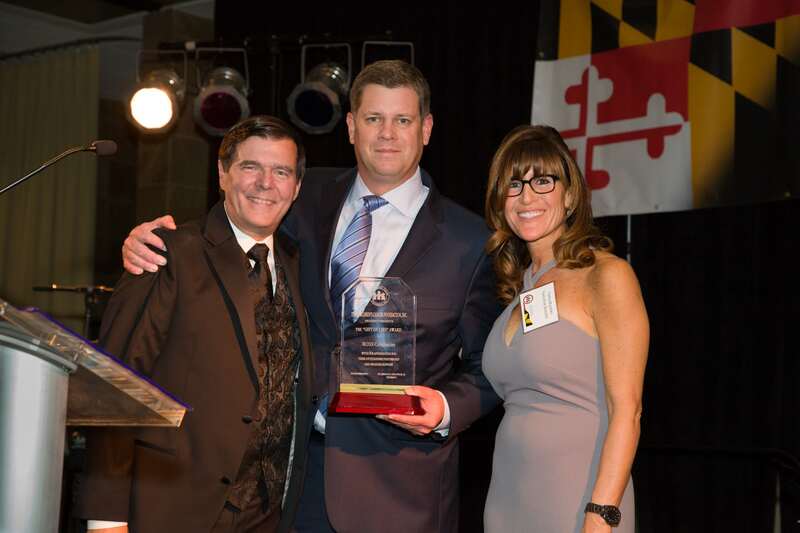 CCF President Jerry Chadwick and CCF Executive Director Tasha Museles present the 2017 Gift of Life Award to ROSS Companies, received by its CEO, David Miskovich. David Miskovich elected to Board of Directors of The Children’s Cancer Foundation, Inc. The Children’s Cancer Foundation, Inc. (CCF) is pleased to report that David Miskovich, CEO of ROSS Companies, has been elected to serve on its Board of Directors. Since its founding by Shirley Howard in 1983, CCF has awarded over thirty-seven million dollars in grants to hospitals and institutions in the Baltimore-Washington area for pediatric cancer research, treatment facilities, and programs that improve the quality of life for pediatric cancer patients. Mr. Miskovich joined ROSS Companies in 2003, and was appointed CEO in November 2016. ROSS Companies is a leader in multifamily acquisitions, property management and renovation in the Mid-Atlantic region, with local offices in Bethesda, MD and Richmond, VA.
CCF presented the Gift of life Award to ROSS Companies at its annual Gala in November 2017, recognizing ROSS’ commitment to giving back to the community and making a difference for children with cancer. A New Jersey native and a graduate of George Mason University, Mr. Miskovich lives in Virginia with his wife and three children.